Release and Iteration lengths are highly dependent upon local circumstances. But, given the ability, I prefer to do Quarterly Releases and Weekly Iterations. A development iteration is a normal iteration. The customer pick stories for the team to build, as described above. A slack day or iteration is just like a development day or iteration except that Team decides what work to take on, from exploratory testing to refactoring items on the Technical Debt Backlog, to spiking new technologies. No new stories are implemented during slack time, though new tests may be added to shore up code coverage. And, the review, deployment and planning iteration is exactly that: review the release, deploy it, and plan the next release. Short iterations allow for rapid customer feedback. Longer iterations allow for more work to be accomplished. In my experience, Weekly Iterations provide the best balance between getting stuff done and running off into the weeds. Plus, it has the side benefit of guaranteeing you your weekends off! Planning happens first thing in the morning on the first day of the week. The rest of the time is devoted to implementing user stories, exploratory testing, etc. Each release and iteration should begin with a planning session designed to select some number of user stories from the parent backlog for inclusion in the current cycle of the process. For example, during Release Planning, user stories are selected from the Product Backlog for implementation in the next Release. Each release and review should end with a review meeting wherein the Product Owner (and other stakeholders) is shown the running acceptance tests and asked to approve or reject them. If an item is approved, it becomes part of the next release. If it is rejected, it is placed into the backlog for the next iteration (or release, potentially). 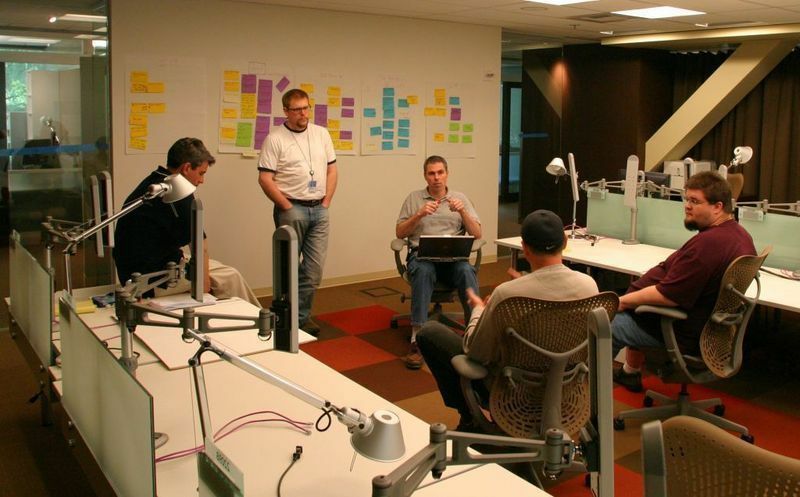 These meetings are also often the source of additional user stories for the backlog. For example, the Product Owner may accept a user story as it is, but desire that something about it change in the next iteration before accepting the feature in the release review. While I was with patterns & practices, Microsoft invested a considerable sum of money to build the team a custom space that that lent itself to agile software development. My friend Darrell Snow was largely responsible for securing the project and shepherding it through the 40 some odd cooks who want to put their fingers in the stew. Overall, it turned out amazingly well - though the team spaces could be a bit bigger, IMHO. Even so, I really miss working in that space. Most of the photographs below were all taken shortly after the team moved into the space. For context, the first picture shows what our team room looked like before the new space and the second picture is a floor plan of the new space. The main thing that distinguishes legacy code from non-legacy code is tests, or rather a lack of tests. In other words, if you’re still writing code without tests, you’re still writing legacy code. That’s a big ball of mud! But, the one I’m currently using is still my favorite: Weed & feed your software. While trying to figure out how to SEO this new site, today, I ran across a few pictures from my time at Microsoft. It brought back some fond memories. One thing I've got to say for that company that you don't often hear is that their facilities are amazing - especially the p&p offices and the conference center where these shots were taken. I love listening too Ward Cunningham discuss the way he thinks. In this video, he "reflects on the history, motivation and common misunderstanding of the 'debt metaphor' as motivation for refactoring." So, I got tired of fighting WordPress and spending money to host it. I wanted something a bit simpler that would let me focus on writing. So, I’ve moved CodeGardener.com to Posterous, and refreshed the look considerably. I’m still not done with the redesign. The links in the navigation pane aren’t all working yet. And, I need to work on the other views (search, tags, etc.) But, the general look and feel is pretty much complete. Overall, the process has been pretty smooth. It was refreshingly simple compared to WordPress. Though, Posterous has a nastly little habit of applying styles to your content without your knowledge. As I discover ones I don’t like (e.g. the large-quote, medium-quote, small-quote nonsense), I’ll stomp on them with some CSS of my own. Best of all, I’m sending this post via email, which is exactly what I wanted. Hopefully, I won’t have to spend several minutes fixing it once it hits the web. UPDATE: Raw email didn’t handle paragraphs the way I wanted. Let’s try using Markdown. UPDATE 2: Markdown works great! Might even want to go back and implement it more broadly throughout the site, since it’s so much easier to read than HTML.